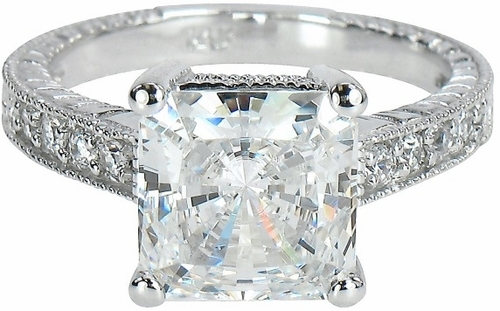 The 2.5 Carat Tiburon Princess Cut Engraved Cubic Zirconia Engagement Ring features a 2.5 carat 8x8 princess cut cz center highlighted by engraved and milgrain detailing. The Tiburon Princess Cut Cubic Zirconia Engagement Ring features four pave set round cubic zirconia that are set down each side of the shank. 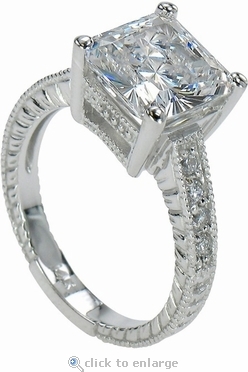 All Ziamond items feature the finest quality of hand cut and hand polished cubic zirconia. 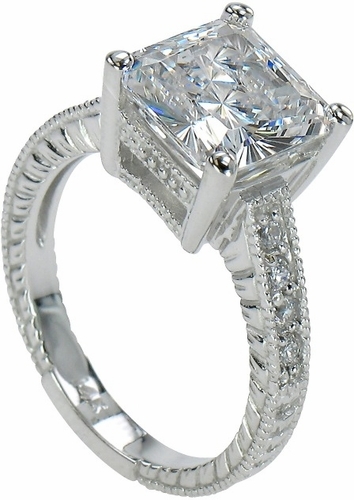 The Tiburon Princess Cut Cubic Zirconia Engagement Ring includes over 3 carats in total carat weight and the band measures approximately 3mm in width.